I believe in providing my patients with the exceptional care that I would expect for myself or a loved one. Dr. Barna is a board certified and fellowship trained interventional pain physician who focuses on the minimally invasive care of spine conditions and other chronic pain conditions. He serves as an Assistant Professor of Orthopedics and Sports Medicine at University of South Florida, as an academic editor for the journal, Medicine, as well as a reviewer for the Journal of Orthopaedic Trauma. Dr. Barna has been recognized on Becker’s Orthopedic and Spine Review List of 150 Pain Management Physicians to Know, and is a Patients’ Choice Award winner. Prior to moving to Tampa to join the Florida Orthopaedic Institute in 2011, Dr. Barna spent nearly 10 years at Harvard Medical School including roles as Assistant Professor of Medicine and Assistant Professor of Anesthesiology, as well as Medical Director of the Massachusetts General Hospital Pain Center. Conditions Treated include back and neck pain, spinal stenosis, bulging or herniated disc, sciatica, degenerative disc disease, pinched nerve, facet joint arthritis, spondylosis, failed back surgery, vertebral compression fractures, CRPS, whiplash, occipital neuralgia, cervicogenic headache, and chronic extremity pain. Minimally Invasive Treatments include image-guided epidural steroid injection, facet joint injection, SI joint procedures, radiofrequency ablation (rhizotomy), kyphoplasty, spinal cord stimulation, sympathetic block, minimally invasive lumbar discectomy, and bone marrow aspirate stem cell injection (for disc degeneration, hip, knee, shoulder joint arthritis). I have had back and sciatica issues for a while. After an informative visit to see Dr. Barna and discuss my options, we came up with steroid injections in the back. Dr. Barna was professional and caring. He suggested a plan of action that I agreed with and we proceeded. I have had all the pain in one side gone and working on the other. Dr. Barna literally saved my life. I was left in horrific pain for almost four months from a surgeon’s mishandling of my pain issue after surgery. They even refused to do another diagnostic MRI. I went to Dr. Barna who immediately ordered the MRI, then got me into his treatment for steroid injections. I have been absolutely pain free for the last three years and back to my normal active life! Dr. Barna allowed me to have one of the better doctor experiences that I have had since moving to Florida. Appointments are on time and he takes the time to answer all of my questions. The staff look at you when responding to questions and are very pleasant and easy to talk to. Five stars just isn’t enough. My husband has been seeing Dr. Barna since 2016. After several appointments with surrounding spine institutes, we made an appointment with Dr. Barna. He is outstanding! His specialty is Interventional Spine and Regenerative Medicine. His interventional procedures have kept my husband from having recommended spine surgery. A car accident in 2016 left him with bulging, herniated and ruptured discs. He was in constant pain and unable to function. Dr. Barna came to the rescue. His bedside manner is impeccable. He sits and listens and recommends a course of action. He thoroughly explains the procedure and answers any questions or concerns. His assistant, Carlos, is an added bonus. He is friendly, helpful and so thorough. He constantly works for you with scheduling and insurance approval. I highly recommend Dr. Barna. Dr. Barna was wonderful. He listened and answered all my questions very well. I found him to be kind, considerate and understanding. He was careful to show me my MRI and explain the details of my herniated disc. I know I am in very good hands. I was in a great deal of pain and Florida Orthopaedic Institute was able to figure out why. I started with steroid shots that didn’t last long for me. Dr. Barna did nerve ablations and it worked great for me. I was comfortable during the procedure. I was sore for the first few weeks and I took it slow, but the pain, that had made me not want to get out of bed, was gone. It’s a tremendous relief to be out of pain. Dr. Barna is an amazing doctor. Dr. Barna is amazing! If there were more stars, he’d get them all. He did a procedure on my cervical spine in 2016, which greatly improved my quality of life. When I recently injured my lower back, I knew Dr. Barna was the person I trusted to help resolve the issue. He and his staff are professional, knowledgeable, kind and just quality human beings. I can’t say enough good things about my experiences with Dr. Barna and his staff. Kudos!! I can’t say enough great things about my experience at Florida Orthopaedic Institute – Citrus Park! Naki and Christina at the check-in desk were so pleasant and efficient. It took hardly any time to complete the needed work and they made me smile.The Administrative Assistant, Carlos, was professional and personable. He put me at ease right away with his quiet efficiency and charm. For me, though, the #1 reason for my visit was Dr. Barna. He took care of a cervical spine issue for me in 2016 and made such a difference in my quality of life. So when I injured my lower back, I knew exactly who I wanted to treat me. I was not disappointed. He is knowledgeable and compassionate. I wouldn’t trust anyone else with my spine, he’s that good. If there were more than five stars, I would award them all to Dr. Barna and the staff at Florida Orthopedic Institute- Citrus Park! Dr. Barna went into great detail to explain my initial MRI. He never discounted or disregarded my issue and I really appreciated it. His concern led to additional scans of the surrounding area of my moderate to severe pain. A correlating issue between the thoracic and cervical spine was identified. These next few days and weeks will only tell but, I feel comfortable and confident with his approach. His entire office staff has been nothing short of professional and courteous. I took my mother to see Dr Barna. We found him to be patient, thorough and empathetic with her situation. I’d recommend him and his practice without hesitation. Dr. Barna changed my life. He took the time to explain what my issue was and gave me various treatment options. He exceeded my expectations. His staff is very welcoming and they take the time to guide you in the process. Carlos, his assistant, also helped me understand the next steps to take. Dr. Barna understood my concerns, questions, and spent the necessary time to explain what my options were. He was very professional! Dr. Barna was personable, knowledgeable, and thorough. Dr. Barna did an outpatient surgical procedure on my lower back with great results – the pain has gone away. It was a very cut and dried process. The office and surgical staff who supported him was likewise outstanding – got insurance approval quickly, called to keep me in the loop, very efficient when I went into surgery and out. Nice follow up as well. I found the Florida Orthopaedic Institute through my Primary Care Provider and was lastly seen by Dr. Steven Barna there. The severe and painful lower back problem which I suffered with for a long time is now simply a memory. I am currently pain-free after the minimally invasive procedure that Dr. Barna performed. I am so grateful to him for his honesty, professionalism and especially his expertise! Dr. Barna, gave me my life back. After 5 years of constant lower back pain, and having surgery, acupuncture, and many other procedures, elsewhere, there was no relief. Familiar with Florida Orthopaedic Instutute, giving my husband a new hip in November, Dr. Lyons, it was now time for me to get better. Dr. Barna, suggested lower lumbar epidural steroid injection. 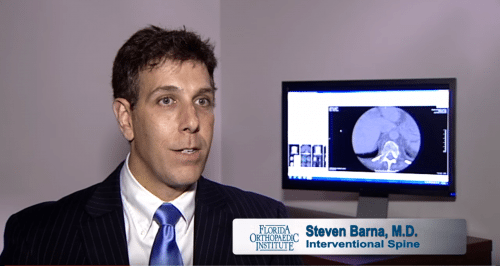 A week later I was at the FOI surgical center, ready to be pain free, and Dr. Barna did not disappoint. I am now able to do things I haven’t done in 5 years, or thought I may never be able to do. A week later I was able to take my granddaughter to the zoo and walked for five hours, pain free!!!! Thank you from the bottom of my heart…. Am I A Candidate For Regenerative Medicine? Article published in the Spring 2015, Journal of the Spinal Research Foundation. 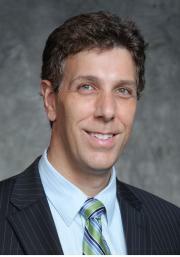 Dr. Barna is featured on Becker’s Spine Review list of 150 pain management physicians to know!